This message style is the realisation of design ideas I’ve had in my head over the past few months. It builds on the basic stripped-down code of a previous, unreleased theme. I release this message style as CC-BY/NC/SA. 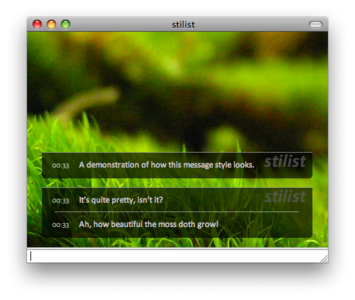 If you redistribute or modify, please include a credit to stilist. Please comment if you have a suggestion or a problem—I’ll see what I can do. ‘Field of Moss’ is by Pipistrula, and is released as CC-BY/NC/SA. ‘Full Moon over Fitzroy’ is by johncarney and released as CC-BY/NC. Finally, ‘Sunset’ is by me, based on the sky in Fort Photo’s ‘Grand Crescent Moon Sunset’, and is released as CC-BY/NC/SA. Note: This theme looks best if Calibri is installed, but will fall back to Tahoma. I’m having trouble with two of your requests, unfortunately. 2) Completely change the display of the timestamp. I may go with 2) next update, but for now I’ve widened the box slightly. Second, what changes would you suggest for the compact version? I browsed through the default themes, but didn’t see anything that looked appropriate. This may change depending on how I handle the timestamp situation, of course. The nice thing with timestamps is that they're all the same width. This means you shouldn't generally need to specify the width, only the padding desired (unless you really want a fixed, rather than consistent, column width). If you add "white-space: nowrap;" to .time, the timestamp column will automatically expand to be as wide as necessary for the user-selected timestamp format. If you don't want this, you can still prevent undesirable timestamp-wrapping by explicitly formatting the timestamp in your html. I'll have to get back to you with suggestions for a compact version. other than that, u did a really good job! I’ve added in two new backgrounds and changed it so long names are cut off. With regard to variants, what sorts of things would you like to see? is it just me, or will this not work with other fonts? also, can you add an option to display screen names? Great theme, my new favorite. Since 1.1 letters such as jygp have their lower case dangly parts cut off. It's less noticeable with Calibri installed, but a couple rows of pixels are still missing even with the suggested font. Amazing! The backgrounds compliment the style, brings back good memories of GAIA. However, you need to work on the way usernames are displayed. The style leaves something to be desired. Personally, I think that the usernames should be smaller, and outside of the chat window. They just look out of place at the moment. See description for image credits; the rest is by me.